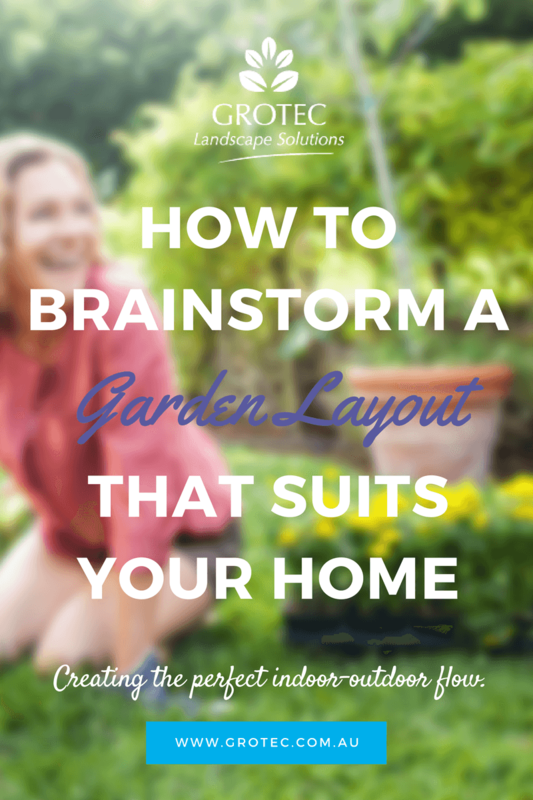 A garden layout needs to consider different uses of areas. Begin by showing an indoor-outdoor flow with the use of a deck or patio. Different types of gardens and linking paths should also be included in the garden. When considering your garden layout in our sub-tropical climate, identify areas of sun and shade throughout the day, and the differences between seasons. Discuss with Grotec the size and position of the existing deck, or where one should be built if the garden is new. The garden layout should take into account all the different kinds of uses of the deck and the surrounding spaces: an entertaining space, a place for cooking and eating, or just for relaxing, a young children’s area, or food productive gardens in raised beds. In a landscape design plan, the use made of the deck throughout the year is increased by providing shade or warmth – a pergola, a shade sail, or a louvered or glass roof to give shade, and heat from outdoor fireplaces or heaters in winter is kept in. Grotec can advise on the garden layout to suit you, and the local conditions. 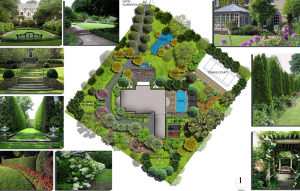 The areas of garden that can be included could be flowers for picking (some annuals and perennials), contemporary planting (use of flaxes, grasses and some natives), and vegetables and fruit areas, which all need to be included as the garden layout is planned. There are numerous options of materials to create paths to and from different parts of the garden – concrete, bark, gravel, or shells can be used to create a safe path to use in wet weather, as well as defining the areas in the garden layout. Consider elements you can add, like a children’s area with apparatus, furniture on the deck, including a barbecue or outdoor oven, extra seating in the shady areas of the garden. Lighting can enhance special features in your garden layout, and some source of music can also be added. 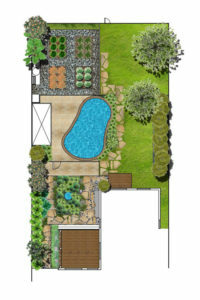 Consult Grotec’s experts, and develop a garden layout to suit you. Please note: All plans in the post have been designed by Grotec Landscape Solutions.